Halle Siepman is an artist, born and raised in Los Angeles. She moved to the San Francisco Bay Area as a teenager, and received a BFA in Painting at Sonoma State University. After working in the travel industry, she moved to the Midwest for graduate school. Halle completed her MA in Painting and is expected to receive her MFA in Painting with a minor in Printmaking at the University of Iowa in May 2015. She is the recipient of the Stanley International Research Award for preliminary research in the modern restoration efforts of the Parthenon in Athens, Greece. She works in a variety of mediums, including printmaking, watercolor, drawing, and photography. Drawn to architecture and building design, Halle considered architecture school, but chose painting and drawing instead to create architectural imaginations filled with colorful parallel swirls. 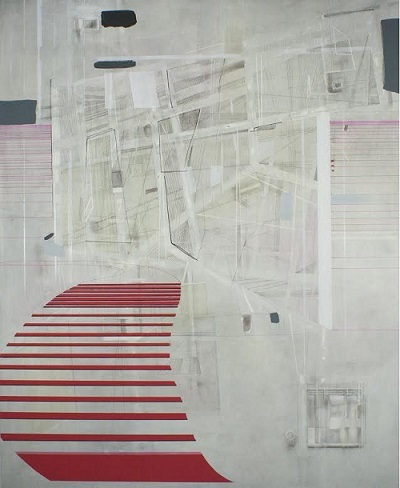 She bundles her experiences abroad in her memory repertoire and then extracts them to reenact and fictionalize them in her architectural drawings, prints, and paintings. Through the use of geometric forms and parallel lines, she "creates" space to navigate through, around and in-between and to remind her of her incredible travel moments. Halle writes, "Inspired by the precision of linear perspective as a mental construct, I seek to explore the history of architectural thinking, from ancient sites in Greece to the pioneer Le Corbusier and the asymmetrical postmodern architecture of Frank Gehry and Zaha Hadid. My artwork embodies experiencing architectural space first-hand. Recently, I stood inside the Parthenon, ascended a medieval staircase, and was situated in the open air. These experiences are what I want to share with the viewer. My architectural imaginations are therefore not only about architecture, but about the viewer's perception and memory of that mass and space created as one moves through and experiences it. I examine the conflict between passively living in architectural space and actively forging my own space. During childhood, I questioned my physical surroundings and started drafting ideal architectural homes to 'depart' from the experiences of growing up with seven siblings. Drawing lines helped me define my role within an otherwise challenging realm. I found emotional balance through the discovery of discernible patterns especially when looking through the sides of thick glass; I saw infinite parallelism and abstraction. Thus, I call on the viewer to reimagine a new world by examining architectural and geometric potential."